This week over at the Forest QAL Joanna from Shape Moth has a pattern for a Roaring Deer. I think it is an awesome Elk. I couldn't wait to get started on him and right away started hunting thru my stash for some fabric choices for him. I started to make his antlers a lighter color but didn't like how they looked with my background fabric. I loved the print but it just didn't have enough contrast and I didn't want to have them get lost in the background and not really be seen to there full potential. I decided to make those four sections again with a different fabric. I could have chosen to use a different background like a forest green and then those antlers probably would have been great, but it was easier to replace 4 sections then all the others. So I choose a darker fabric for the antlers. This was a pretty cool second choice. Somehow the antlers remind me of a Jan Brett children's story book illustration. It stared me thinking of how cool this elk would look in whimsical Christmas fabric. Hmmm...maybe another day I will challenge myself to try that??? I wonder if my stash is up to that or if I will have to keep my eye out for just the right fabrics to create that deer. 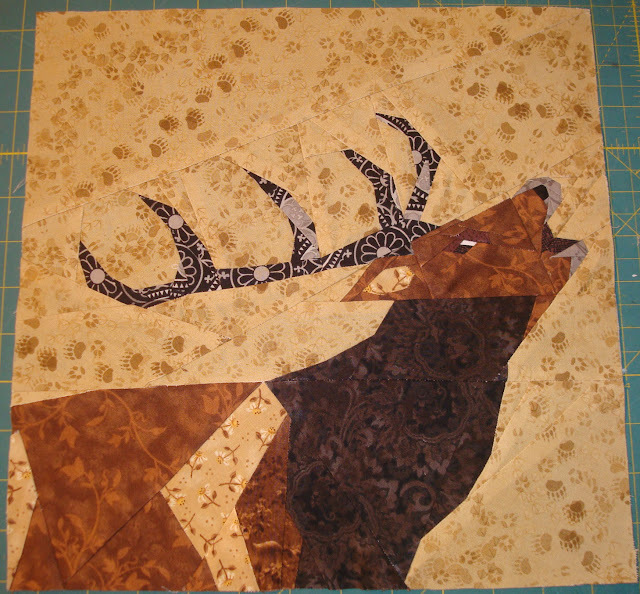 Any how this is how my elk turned out this time with these fabrics. He would even look great in all black and white fabrics and could still carry off that Jan Brett appeal. I will have to just stop thinking of all the possibilities and wait and see what the others in the group will do with this pattern. I am so addicted to seeing their creations on flickr. Don't you just love flickr groups!!! and triumph over our adversaries be they foreign or domestic. The strength of the American people and pride in our country will always stand proud and United. God Bless Boston and the American Spirit of her people!!! He turned out so beautiful! That is just gorgeous!!! Great job too.